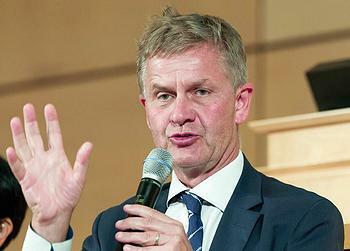 NAIROBI, Kenya, November 27, 2018 (ENS) – The head of the United Nations environment agency, Erik Solheim of Norway, has resigned after the British newspaper “The Guardian” revealed excess travel expenses and rule breaking that led some countries to withhold funds from the agency. “The Guardian” reported that Solheim was asked to resign by UN Secretary-General António Guterres. The newspaper quoted unnamed”sources” at the UN Environment Programme, UNEP, who said that countries critical of Solheim’s conduct were withholding tens of millions of dollars, threatening a financial crisis at the body. A draft internal UN audit leaked to “The Guardian” in September found Solheim had spent almost US$500,000 (€439,800) on air travel and hotels in just 22 months, and was away from the agency’s Nairobi headquarters 80 percent of the time. The audit said this was a “reputation risk” for an organization dedicated to fighting climate change. The audit said Solheim had “no regard for abiding by the set regulations and rules” and had failed to account properly for some of his travel. He also reportedly allowed selected staff members to work from Europe rather than at UNEP headquarters in Nairobi. Solheim told “The Guardian” he had already paid back money for instances of oversight and made changes where other rules had been broken. Nevertheless, the UN secretary general’s official spokesman said Guterres had accepted Solheim’s resignation. UNEP’s deputy executive director, Joyce Msuya, a Tanzanian microbiologist and environmental scientist, has been appointed acting head of the agency while a replacement for Solheim is sought.